Hairy cell leukemia is a disease in which a type of white blood cell called the lymphocyte, present in the blood and bone marrow, becomes malignant and proliferates. It is called hairy cell leukemia because the cells have tiny hair-like projections when viewed under the microscope. Hairy cell leukemia (HCL) is a rare cancer. 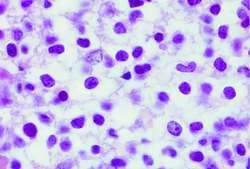 It was first described in 1958 as leukemic reticuloendotheliosis, erroneously referring to a red blood cell because researchers were unsure of the cell of origin. It became more easily identifiable in the 1970s. There are approximately 600 new cases diagnosed every year in the United States, making up about 2% of the adult cases of leukemia each year. HCL is found in cells located in the blood. There are three types of cells found in the blood: the red blood cells that carry oxygen to all the parts of the body; the white blood cells that are responsible for fighting infection and protecting the body from diseases; and the platelets that help in the clotting of blood. Hairy cell leukemia affects a type of white blood cell called the lymphocyte. Lymphocytes are made in the bone marrow, spleen, lymph nodes, and other organs. It specifically affects B-lymphocytes, which mature in the bone marrow. However, extremely rare variants of HCL have been discovered developing from T-lymphocytes, which mature in the thymus. When hairy cell leukemia develops, the white blood cells become abnormal both in the way they appear (by acquiring hairy projections) and in the way they act (by proliferating without the normal control mechanisms). Further, the cells tend to accumulate in the spleen, causing it to become enlarged. The cells may also collect in the bone marrow and prevent it from producing normal blood cells. As a result, there may not be enough normal white blood cells in the blood to fight infection. The median age at which people develop HCL is 52 years. Though it occurs in all ages, HCL more commonly develops in the older population. Men are four times more likely to develop HCL than women. There have been reports of familial aggregation of disease, with higher occurrences in Ashkenazi Jewish men. A potential genetic link is undergoing further investigation. The cause of hairy cell leukemia is not specifically known. However, exposure to radiation is a known cause of leukemia in general. Familial involvement is another theory, suggesting that there is a genetic component associated with this disease. Pain and discomfort are caused by an enlarged spleen, which results from the accumulation of the abnormal hairy cells in the spleen. Blood tests may show abnormal counts of all the different types of cells. This happens because the cancerous cells invade the bone marrow as well and prevent it from producing normal blood cells. Because of the low white cell count in the blood, the patient may have frequent infections. Fever often accompanies the infections. The patient is most susceptible to bacterial infections, but infections of any kind are the major cause of death. The low red cell count may cause anemia, fatigue, and weakness, and the low platelet count may cause the person to bruise and bleed easily. When a patient suffers from the above symptoms, the doctor will palpate the abdomen and may order scans to see if the spleen is enlarged (splenomegaly). An enlarged spleen is present in 80% of patients. An enlarged liver is less common, but can occur. If the spleen is enlarged, the doctor may order several blood tests. In these tests, the total numbers of each of the different types of blood cells (CBC) are reported. Sixty to eighty percent of patients suffer from pancytopenia, which is a dramatic reduction in the number of red blood cells, white blood cells, and platelets circulating in the blood. If the blood tests are abnormal, the doctor may order a bone marrow aspiration and biopsy. In order to establish a diagnosis, hairy cells must be present in the bone marrow. Stage I: Hemoglobin greater than 12 g/dL (1 g = approximately 0.02 pint and 1 dL = approximately 0.33 ounce) and spleen less than or equal to 10 cm (3.9 inches). Stage II: Hemoglobin between 8.5 and 12 g/dL and spleen greater than 10 cm (3.9 inches). Stage III: Hemoglobin less than 8.5 g/dL and spleen greater than 10 cm (3.9 inches). Since there is generally no accepted staging system, another method for evaluating the progression of HCL is to group patients into two categories: untreated HCL and progressive HCL, in which hairy cells are present after therapy has been administered. Some people with hairy cell leukemia have very few or no symptoms at all, and it is reasonable to expect that 10% of patients may not need any treatment. However, if the patient is symptomatic and needs intervention, HCL is especially responsive to treatment. There are three main courses of treatment: chemotherapy, splenectomy (surgical removal of the spleen), and immunotherapy. Once a patient meets treatment criteria, purine analogues, particularly the drugs, pentostatin and cladribine, are the first-line therapy. Pentostatin is administered at 5mg/m2 for two days every other week until total remission is achieved. Patients may experience side effects such as fever, nausea, vomiting, photosensitivity, and keratoconjuctivitis. However, follow-up studies estimate a relapse-free survival rate at 76%. Cladribine (2-CdA) taken at 0.1mg/kg/day for seven days also has an impressive response. Eighty-six percent of patients experience complete remission after treatment, while 16% experience partial remission. Fever is the principal side effect of 2-CdA. Biological therapy or immunotherapy, where the body's own immune cells are used to fight cancer, is also being investigated in clinical trials for hairy cell leukemia. A substance called interferon that is produced by the white blood cells of the body was the first systemic treatment that showed consistent results in fighting HCL. The FDA approved interferon-alpha (INF-alpha) to fight HCL. The mechanism by which INF-alpha works is not clearly understood. However, it is known that interferon stimulates the body's natural killer cells that are suppressed during HCL. The standard dosage is 2 MU/m2 three times a week for 12 months. Side effects include fever, myalgia, malaise, rashes, and gastrointestinal complaints. If the spleen is enlarged, it may be removed in a surgical procedure known as splenectomy. This usually causes a remission of the disease. However, 50% of patients that undergo splenectomy require some type of systemic treatment such as chemotherapy or immunotherapy. Splenectomy is not the most widely used course of treatment as it was many years ago. Although the spleen is not an indispensable organ, it is responsible for helping the body fight infection. Therefore, other therapies are preferred in order to salvage the spleen and its functions. Most patients have excellent prognosis and can expect to live 10 years or longer. The disease may remain silent for years with treatment. Continual follow-up is necessary to monitor the patient for relapse and determine true cure rates. Since the cause for the disease is unknown and there are no specific risk factors, there is no known prevention. Anemia — A condition in which there is low iron in the blood due to a deficiency of red blood cells. Bone marrow — The spongy tissue inside the large bones in the body that is responsible for making the red blood cells, white blood cells, and platelets. Bone marrow aspiration and biopsy — A procedure in which a needle is inserted into the large bones of the hip or spine and a small piece of marrow is removed for microscopic examination. Immunotherapy — A mode of cancer treatment in which the immune system is stimulated to fight the cancer. Keratoconjunctivitis — Inflammation of the conjunctiva and cornea of the eye. Leukemia — A disease in which the cells that constitute the blood become cancerous or abnormal. Lymph nodes — Oval-shaped organs that are the size of peas, located throughout the body, and contain clusters of cells called lymphocytes. They filter out and destroy the bacteria, foreign particles, and cancerous cells from the blood. Malignant — Cells that have the ability to invade locally, cause destruction of surrounding tissue, and travel to other sites in the body. Spleen — An organ that lies next to the stomach. Its function is to remove the worn-out blood cells and foreign materials from the blood stream. Splenectomy — A surgical procedure that involves the surgical removal of the spleen. Bast, Robert C. Cancer Medicine. Lewiston, NY:B.C. Decker Inc., 2000. Haskell, Charles M. Cancer Treatment. 5th ed. Philadephia: W.B. Saunders Company, 2001. American Cancer Society. 1599 Clifton Road, N.E. Atlanta, Georgia 30329. (800) 227-2345. http://www.cancer.org. Cancer Research Institute (National Headquarters). 681 Fifth Avenue, New York, N.Y. 10022. (800) 992-2623. http://www.cancerresearch.org. Hairy Cell Leukemia Research Foundation. 2345 County Farm Lane, Schaumburg, IL 60194. (800) 693-6173. Leukemia Society of America, Inc. 600 Third Ave, New York, NY 10016. (800) 955-4572. National Cancer Institute. 9000 Rockville Pike, Building 31, Room 10A16, Bethesda, Maryland, 20892. (800) 422-6237. http://wwwicic.nci.nih.gov. Oncolink. University of Pennsylvania Cancer Center. http://cancer.med.upenn.edu. "Coping With Side Effects." National Cancer Institute. July 2, 2001. http://cancernet.nci.nih.gov/chemotherapy/chemoside.html. NCI/PDQ Patient Statement, "Hairy cell leukemia." National Cancer Institute, 2001.
a rare, usually chronic disorder characterized by proliferation of hairy cells in reticuloendothelial organs and blood. 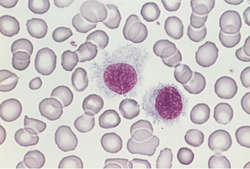 A low-grade B-cell leukemia comprising 2% of adult leukemia, commonly affecting ♂–♂:♀ ratio, 4:1, age 50-55, leading to progressive pancytopenia Clinical Insidious onset, weight loss, bruising, abdominal fullness due to splenomegaly, pancytopenia with normocytic, normochromic anemia, rarely aplastic anemia due to infiltration of BM, spleen, lymph nodes; 10% have platelet counts of < 20 x 109/L–US: < 20,000/mm3, 20% have thrombocytosis; 1-80% of nucleated RBCs are hairy Lab ↑ Acid phosphatase, especially isoenzyme 5–which is ↑ in bone metastases and in Gaucher's disease Management Purine analogues 2'-deoxycoformycin–pentostatin and 2-chlorodeoxyadenosine–cladribine, a purine nucleoside used in low-grade lymphoproliferations–eg, CLL and NHL is more effective than IFN-α Cause of death Infections, gram-negative bacteria, atypical mycobacteria, fungi. See Dry tap. characterized by a covering of hairs. elongated mucosal erosions occur in mouths of horses grazing pasture infested with hairy caterpillars. See also erosive stomatitis. a condition of humans, of which a counterpart is seen in cats. Previous name was reticuloendotheliosis. A comprehensive immunophenotypic marker analysis of hairy cell leukemia in paraffin-embedded bone marrow trephine biopsies--a tissue microarray study. Hairy cell leukemia is a rare chronic B-cell lymphoproliferative disorder characterized by pancytopenia; splenomegaly; and infiltration of the bone marrow, spleen, and liver by malignant B cells that have hair-like cytoplasmic projections (8,9). This increased risk may be related to immunosuppression due to hairy cell leukemia or its treatment. When we normalized with CD19 mRNA, most of the B-NHL-other samples separated away from the MCL samples, except for several patients with hairy cell leukemia, follicular lymphoma, and diffuse large B-cell lymphoma. Concentrations of organochlorines related to titers to Epstein-Barr virus early antigen IgG as risk factors for hairy cell leukemia. BL22 singles out the molecule CD22, which appears on the surface of both hairy cell leukemia cells and a type of white blood cell called a B cell, Kreitman says. Detection of minimal residual disease by immunostaining of bone marrow biopsics after 2-chlorodeoxyadenosine for hairy cell leukemia. Coverage of the Hairy Cell Leukemia pipeline on the basis of route of administration and molecule type. Immunohistochemical detection of hairy cell leukemia in paraffin sections using a highly effective CD103 rabbit monoclonal antibody. Additionally, the report provides an overview of key players involved in therapeutic development for Hairy Cell Leukemia and features dormant and discontinued projects.